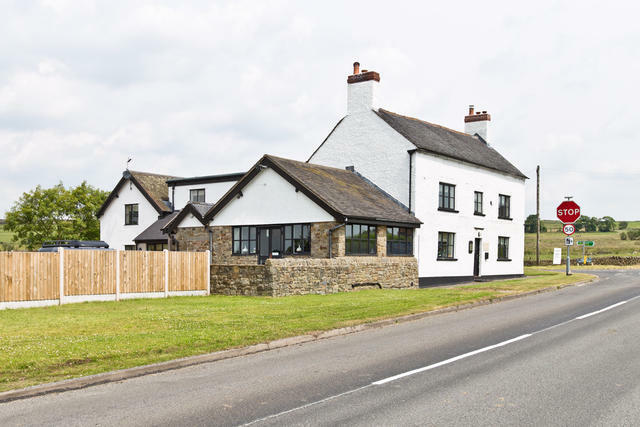 We have rescued and restored this former country pub to its former glory to create an amazing unique self catering venue in a great location. 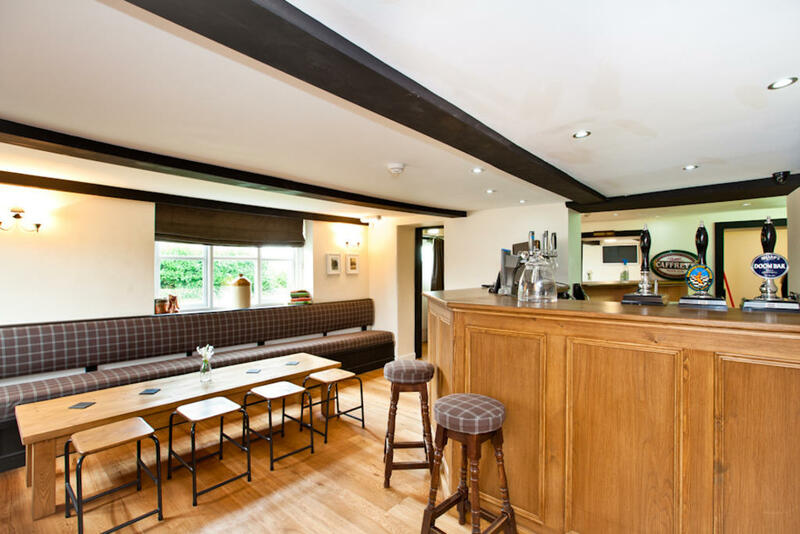 Enjoy exclusive use of your very own private pub with excellent private dining space, a fabulous games room and plenty of outdoor space too. This stunning family friendly self-catering accommodation is in a rural location, yet within striking distance of the southern tip of the stunning Peak District. 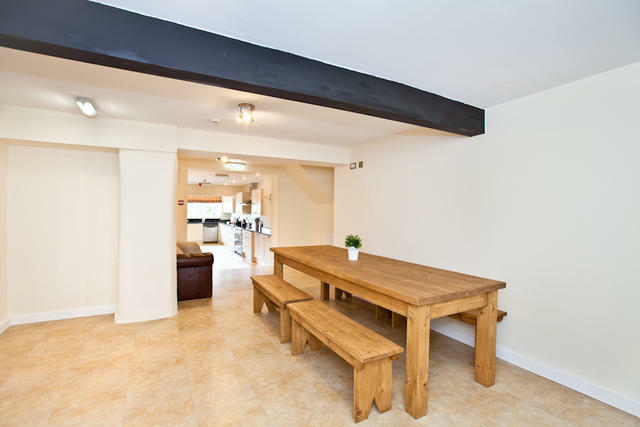 Ideally located close to Dovedale, Ashbourne, Leek, Uttoxeter Races, Illam and Hartington. Alton Towers Resort a mere 7.5 mile drive drive. The Green Man works really well for low key celebrations and relaxed weekends. As you step over the threshold you will find a warren of landings spread over three floors. With a wide choice of freshly decorated light and airy bedrooms, styled with neutral decor, warm creams and coordinating furnishings, the thirteen bedrooms are all a good size (except the bunk bed room which is more compact). All bedrooms can be made into twin and doubles to offer a flexible room set up for all types of groups. 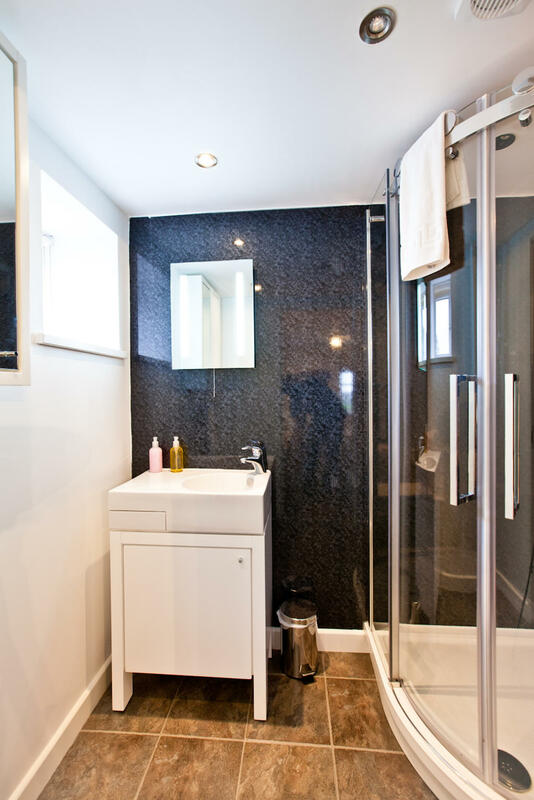 To complement the bedrooms there are a total of 9 en suites and 2 shared bathrooms all newly installed in a gleaming white finish. 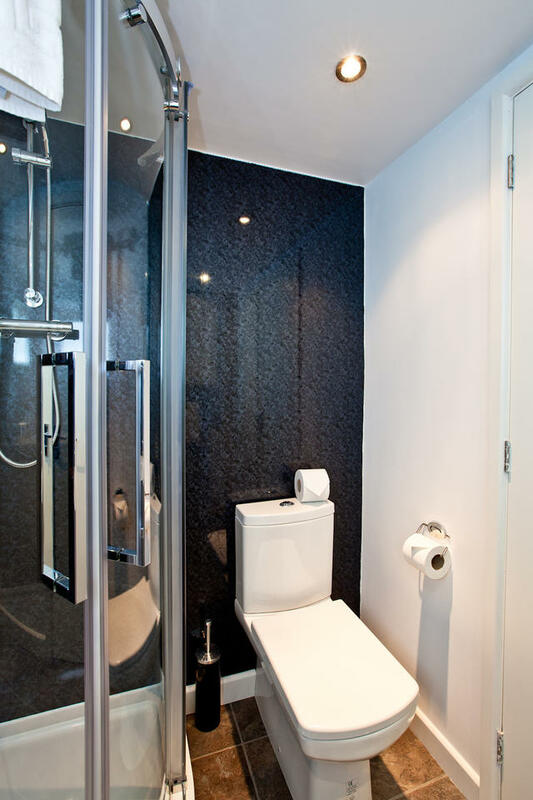 Your beds are made up for your arrival and for added comfort we provide each guest with fresh towels, hand soap and shower gel. 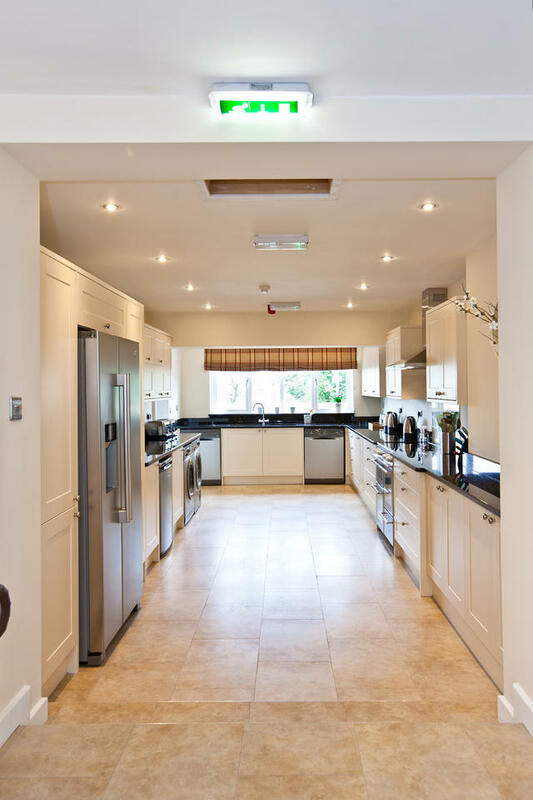 The generous sized modern fitted kitchen is perfect for groups wanting to totally self cater and cook for themselves. 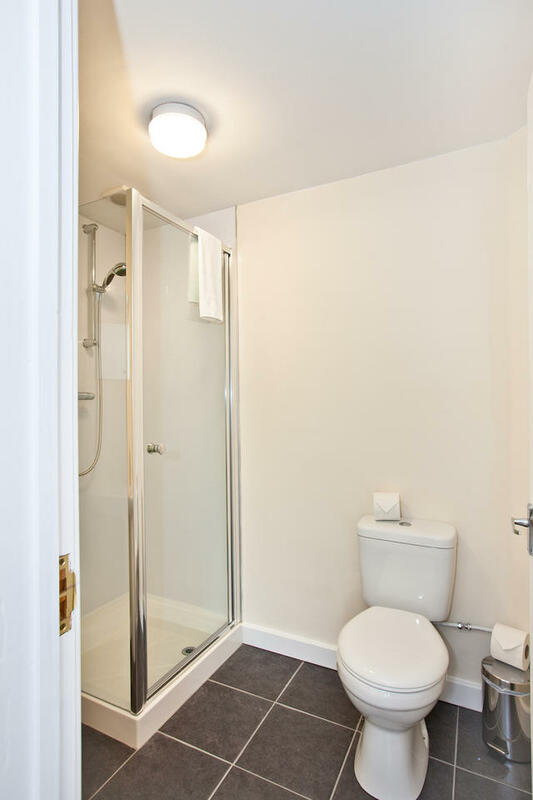 With ample storage, plenty of crockery, cutlery, pot and pans it is well stocked with all the mod cons. 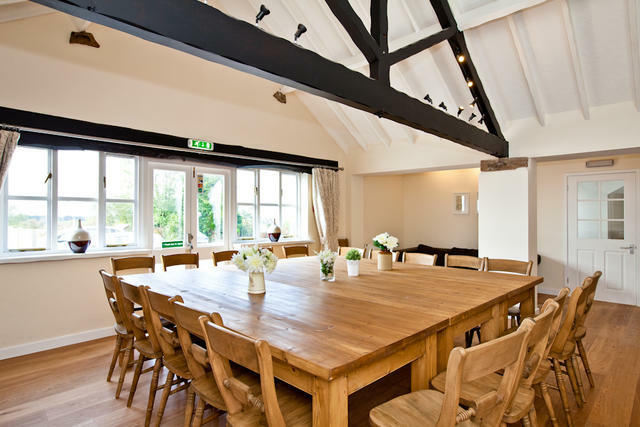 The dining room truly offers a lovely open plan space for group meals with the original Cruck'd beams still on display. You can have flexible layouts for dining dependent on your numbers with solid oak tables, benches and chairs made by local craftsmen. In the evenings after dinner, you can turn it into a cinema room with viewing on the 72 inch wall mounted TV. There is alternative dining space for more informal meals in a open plan room leading off the kitchen with a large farmhouse table and benches. The ground floor of The Green Man is vast, with the original bar area becoming the focal point of the entire stay. Here, you can gather around the wood burning stove, serve your own drinks and perch on a bar stool at the fabulous original bar. 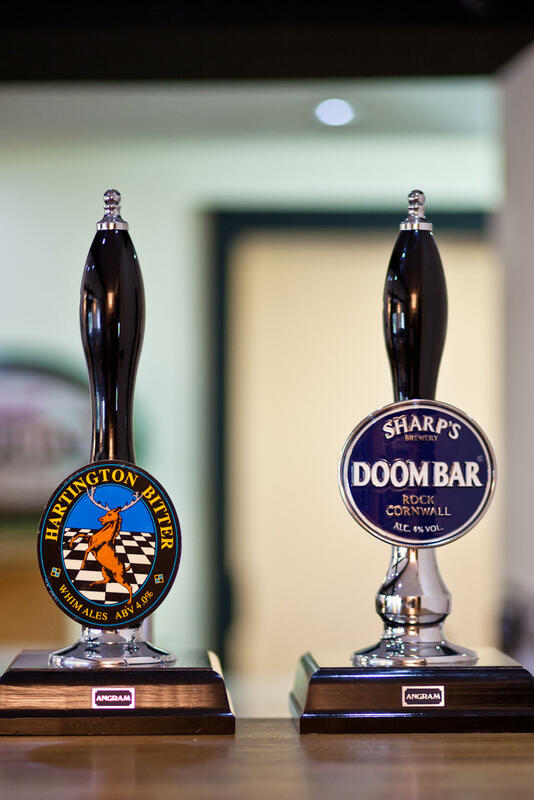 This can be stocked as you wish (please note we have to supply the kegs for the pumps) and there is plenty of glassware, wine fridges and even an ice machine behind the bar. 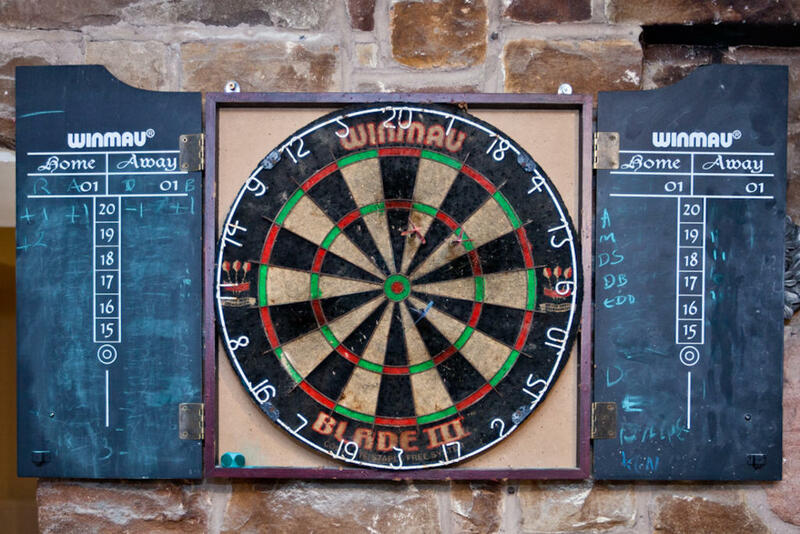 No pub would be complete without entertainment, so just a couple of steps down from the bar area it opens into a games room with pool table and dart board. In addition, you can relax in a cosy lounge are with armchairs and comfy leather sofas. From the dining room doors it leads out to a paved terrace which is perfect for enjoying pre dinner drinks. Across from the main building is a large garden laid to lawn. The garden is substantial in its size and is perfect for a kick around or a game of rounders. You can also BBQ here or on the terrace outside the dining room. We provide a oil drum BBQ for your use - available for use from 01st April through to 31st October, please supply your own charcoal and lighting equipment. 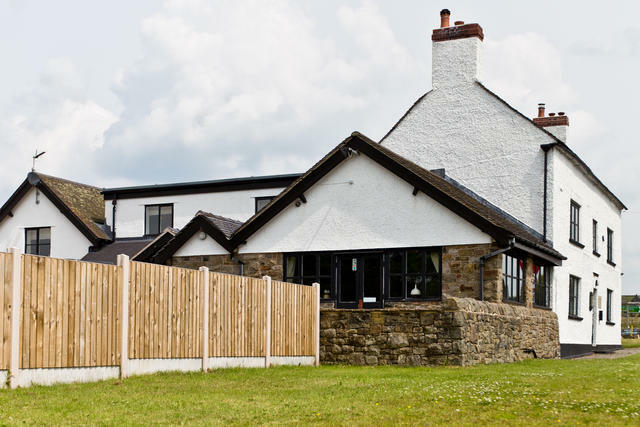 Being a former country pub, there is a very large gated car park for your private use. If you can drag yourselves away from such a wonderful venue, we also have tons of ideas and recommendations if you want to something more adventurous such as off road walking, clay pigeon shooting, caving, abseiling, mountain biking, water sports and rock climbing. 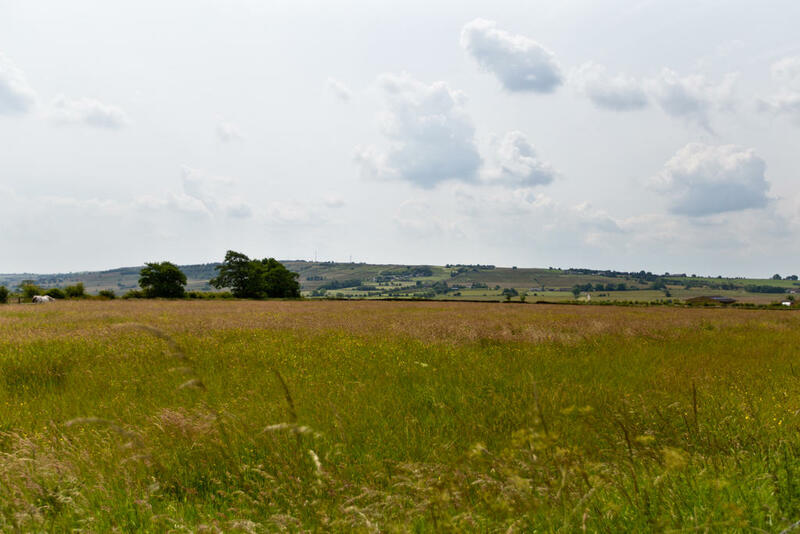 We recommend you venture out and visit the stunning Peak District with its enchanting villages and historic towns such as Buxton, Ashbourne, Leek and Bakewell well as enjoying its glorious ever changing landscapes. The Peak District National Park offers a spectacular variety of scenery from steep sided limestone dales to the dramatic high moorlands. 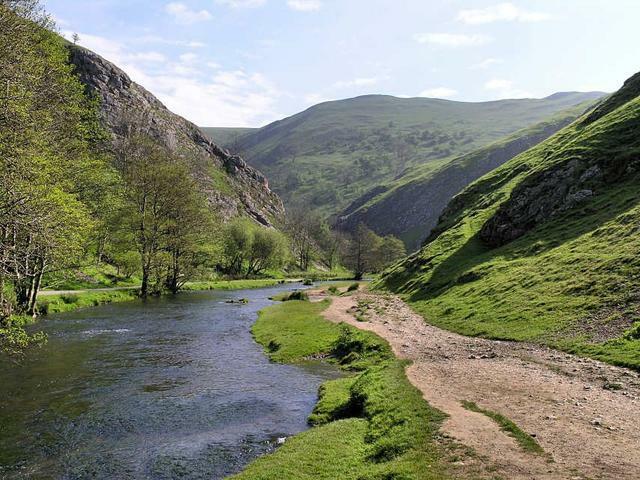 The Green Man is a short drive from Dovedale, Ilam, Alstonefield and Hartington with their amazing walk routes and there is something for everyone whether you want a challenging hike or a short stroll. Just down the road you can hire bikes and jump onto The Manifold trail to explore stunning surrounding countryside and awe-inspiring Thor's Cave and Wetton Mill. Another great adventure is to spend the day at Alton Towers Resort with Splash Landings which is just a 7.5 miles drive away via back country lanes. Turn right at the cross roads onto B5053 (Bottom Lane) and the entrance to the car park will be on your right hand side. You have arrived at The Green Man! Turn left at the cross roads onto B5053 (Bottom Lane)- signposted to Ipstones and the entrance to the car park will be on your right hand side. The following comments are taken straight from the guestbook we keep for The Green Man. Verbatim. Perfect accommodation for our family get together with all my family. We had a wonderful weekend and highly recommend the Green Man. Tracey made us very welcome, was very helpful and informative. We look forward to returning in the future. Many thanks. Lovely venues, perfect for get togethers with family friends. Everything works really well and all very helpful. The Green Man was a fantastic venue, everyone had a great time and everything worked out well. Scoffs and Whim Ales were spot on. Tracey was very kind and helpful. We are looking for next year now as my wife is 50 and you've just got to have a pub in the place, focal point for everyone!!! I would also like to say what a wonderful time we had at The Green Man. A lovely place to celebrate my 50th year with friends. The high standard of the venue was excellent. Tracey was very helpful too. We shall definitely be coming back to another venue soon. Absolutely delighted with the service received and the venue and have already recommended Peak Venues to other colleagues across our company and hope to be using you again soon for my own team! We loved it. It was perfect. Thanks! We had a great weekend, and everyone was impressed with the property, especially the kitchen, and the bar area! We had loads of fun. We had a fabulous time and thoroughly enjoyed ourselves over the weekend - so much so that we are looking to book again!! On top of that I wanted to say a great big thank you to Tracey who showed me round last week and then also welcomed everyone on Friday.. She was absolutely grand and made us all feel like we were in very good hands. We had a great stay at the Green man where 29 family and friends celebrated my 60th birthday. The property is super clean,very comfortable and has everything you could possibly need. Tracey was very helpful in explaining how everything worked. The layout downstairs is a series of linked rooms, which meant that there were plenty of spaces for everyone to spread out and not feel cramped. The bedrooms are spacious, uncluttered and the beds very comfortable. I would definitely recommend this property. We had a great stay at the Green Man and there's already talk of booking our family weekend away for 2018 for this time next year back with you! We really enjoyed our visit to The Green Man (again!) and appreciated how clean and tidy it was when we arrived – Tracey does a great job and is most helpful. Thanks to all at peak venues. Everyone loved the place and it couldn’t have been better. Will look to stay again when an opportunity arises. We had an amazing time at the Green Man, couldn't fault the property or the service of the staff in the lead up to our stay. You made a difficult job of organising it very easy for me! The property was fabulous and I will write a review for you on trip advisor. We would really like to book again so fingers crossed we will be in touch in the future! What an amazing weekend we all had at The Green Man, such a special place with all its quirkiness for celebrations with family. My Son loved running the bar, serving drinks for all the family. The venue was fantastic - everyone had a great time, thank you. We had a wonderful weekend at the Green Man, the venue was perfect for us! Everyone was saying how brilliant the accommodation was. Thanks for being so efficient, making the booking process so easy and sending lots of information through to us prior to our stay. Dear Peak Venues Team We had a fantastic weekend at the Green Man. 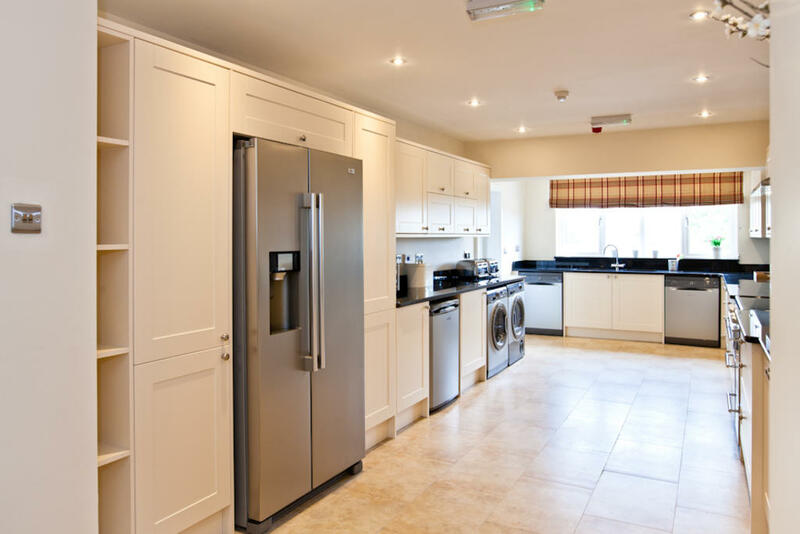 We were very impressed with the quality of the accommodation, how well it was equipped and how helpful Tracey was in explaining the property and helping us to get the DVD players working. Thank you all. We had a great weekend at the Green Man, thank you! Tracey was also very friendly and helpful and the venue was very clean and modern. Our favourite was the bar with drinks fridges available; made it feel like we had our own pub for the weekend! Thank you we had a lovely stay at the Green Man. It was perfect for us and we hope to come back another time! The stay was amazing thank you. We all had a great time. Once again, thanks very much for a great stay. We had a fabulous time at the Green Man! Thanks for a terrific stay. We all had a great time at the Green Man a couple of weeks ago. Absolutely no complaints about the property at all. I would just like to take this opportunity to say what a wonderful venue you have and it was perfect for our weekend. Also I would like to say that Tracey was extremely helpful right from the moment we checked in throughout the weekend and right up until the point we checked out. I have 34 women urging me to book out the venue again for next year. The whole booking and payment process was made extremely easy by the peak venue staff and I just wanted to thank you. The Green Man is an amazing venue and completely exceeded not only mine but all 34 of our expectations. We had a truly wonderful time. The Green Man was absolutely perfect for our group. Now that there are tons of children running around it is really hard to find somewhere that can suit both the adults and the little ones but this place was just right. The ability to pour our own pints from the bar was a real highlight too. I am sure that everyone will want to book it again next year. There were 14 adults, 10 children and 2 dogs celebrating Christmas and a 70th birthday at The Green Man. I cannot recommend this venue highly enough - beautifully clean, warm, and with a very well equipped kitchen. Whim Ales supplied a cask of beer which was so good that it ran out sometime on Boxing Day and the bar area was the gathering point of an evening for carols, billiards, darts and silly games. Waitrose delivered a huge food order from Leek, and the 2 range cookers, each with a double oven were indispensable on Christmas Day. A truly wonderful time was had by all, with lots of happy memories. We really enjoyed our stay, a beautiful part of the world and the cottage had everything we need. The pub is such a focal point! The Green Man was a fabulous venue and was everything we expected and more! We have just returned home from our weekend at The Green Man with our family of 27 ( age range 5-76 years) to celebrate our 50th Birthdays. We had a wonderful weekend , everyone enjoyed the facilities at the venue. It had everything needed for a really enjoyable stay. All the bedrooms are very comfortable, the kitchen is fabulous as is the dining room , lounge and bar area which makes the place a bit different and certainly got our party started. The Green Man exceeded our expectations! We had an Indian take-away from Cloves on Friday which was very good and self-catered the rest of the weekend. The keg of beer went down very well and pulling our own pints was a treat! We visited Ilam Park, walked to Dovedale stepping stones and up Thorpe Cloud and also ran and cycled along the Manifold trail. All were great. Thank you to all at Peak Venues who made the booking process and everything involved in our celebrations so straight forward and easy. We would certainly recommend the Green Man to anyone wanting to organise a large group get together or holiday. Thank you for your e-mail below and yes we did thoroughly enjoy our stay at the Green Man. Tracey was extremely helpful when we arrived and with a couple of minor issues during the weekend. As for a review.... we absolutely loved it. We had 32 of us in total, adults, teens, kids and babies, celebrating my 30th birthday. We all had ample space, everything we could possibly need for our stay and more. Tracey was most helpful and even showed up to give us some milk in case we hadn't got any!! We arranged a food shop to be delivered when we arrived and had more than enough kitchen space for it all. Whim ales was fantastic and the ale was ready to pour when we all arrived. More than enough cots, beds, highchairs etc. Everyone absolutely loved it. We had a takeaway from the Indian restaurant down the road which was delicious, and walked it off at the reservoir not too far away the next morning. I can not wait to book again! Thanks so much. Just wanted to say what a fantastic time we had over the weekend. The Green Man is an exceptional venue and we had compliments from all our guests. Tracey was a an absolute star and so helpful so want to send a BIG thank you to Tracey. Many thanks we had the best time ever!! The Green Man was a great property and Tracey (the Housekeeper) is a credit to your company. We have all had an excellent weekend at the Green Man, to celebrate my mum and dads 60th wedding anniversary. The place is amazing, well equipped and Tracey who met us was excellent. Everybody had a great time and thought the Green Man was a great venue for my 60th. Thank you very much for your email. We all had a fantastic weekend and can honestly say the feedback on the venue was nothing but positive! Thank you again. We will definitely recommend Peak Venues and I am sure we will stay with you again. Had a fabulous time at the Green Man, everyone had such a good weekend catching up and letting the kids all meet up. Would definitely hope to book it again but might let someone else organise it next time! Thanks for the use of the property for the weekend, we used it as a base for our wedding weekend. our guests loved it and it was great to spend the night before and the morning after with our guests. We had a great time during our stay at the Green Man, and would like to say how great Tracy, the housekeeper, was during our stay also. Thank you so much for a great weekend... particularly to Tracey. Thank you we had a wonderful stay. We had a fabulous weekend in a fabulous venue; the whole set up with the bar area was ideal. Our weekend was fabulous. Thanks so much and particularly thanks to Tracey and her team. We will be back! The venue was great and everyone had an amazing time. Already looking at booking again. We visited The Green Man a year ago with the view to booking it for a long weekend for our family, friends and their (grown up) children to celebrate our 60th birthdays; we were hugely impressed with the whole setting and accommodation. So, moving on a year.........we, and 26 others had the most fantastic time one could imagine. The whole experience from start to finish was way beyond our (and our friends) expectations, from the quality of the rooms, the abundance of equipment in the kitchen, the fact that everything worked, the delivery and set up of the barrel of beer, the cleanliness of the whole building; just fantastic. Our guests didn't really know what to expect, and couldn't believe that we actually had a REAL pub for the whole weekend. We would like to make a special mention of Tracey; what a star! From when we had our first visit to when we left, nothing was too much trouble for her. She obviously takes great pride and pleasure from ensuring that people have a wonderful time. Brilliant! Although our visit was a one off experience, we would have no hesitation recommending The Green Man to others, and, indeed the younger members of our group were already talking about future 'get togethers'! Just returned from celebrating a 90th birthday with 20 members of the family & 1 dog. Everyone had a fantastic time at the venue. From the warm welcome from Tracy the Housekeeper, the cosy warm rooms (snow outside but didnt even need to light log burner! ), the well equiped kitchen, immaculate and comfortable bedrooms, relaxing lounge, large dining room to accomodate all the party at once to the the quirky bar areas allowing us all to be Landlords! (Get out of my pub!). Plenty of parking & outdoor space. Would definately recommend the Green Man for any large get together or party. Leek is only short drive with lots a supermarkets (found sainsburys, Morrisons. Waitrose, Asda, Aldi & CO-OP!!) nice market town with some quirky shops & market. On edge of peak district with great views! we all had such a great time at the Green Man and the facilities for a celebration are excellent. Thanks for the email. We had a great time. It's a great place and really well kept. We would recommend it to anyone. Thank you. Our friends were very impressed with the house and are already talking about rebooking in the summer! The whole service has been very professional from initial booking right through to the visit itself. Many thanks for giving us the opportunity to stay in The Green Man for a wonderful weekend! Everybody was amazed at the place as your website photos actually give it a smaller look!! It really did suit our party perfectly. Yes we all had a great time. The Green Man was perfect and have already recommended to other friends. Thank you – we had a super time, and I will provide comments/review. In particular tracy was fantastic and very helpful. I am sure we will be back! We had a fabulous time last weekend. The venue was perfect for our group. What a weekend!! This was a perfect venue for my wife's 40th birthday celebrations. We had friends and family aged from 1 to 75 this last weekend and they all had an amazing time. Loads of space for everyone to spread out, with the teenagers pretty much taking over the pool table and dart board. The bar area is fantastic with loads of room in the fridges. The beer on tap from Whim Ales was great, the first thing everyone wanted to do when they arrived was to have a go at pulling a pint. Kitchen is fantastic with loads of space and every thing you could ever need. The dining room was plenty big enough to fit us all in at feeding time! George's Fish and Chip Shop in Leek was perfect for the night of arrival, they coped very well with such a large order and the food was great. Bedrooms are fantastic, with loads of space and beds for everyone. Beds really comfy and bathrooms really nicely done. The garden is great with loads of space. We brought a football goal with us which went down really well with the kids. House keeper Tracy was fantastic and really helpful throughout our stay, even when one of our guests managed to lock themselves out of their bedroom. I would highly recommend, already planning our next visit! We had the most fabulous time, already planning a return stay. Thank you! Huge thanks again, it's a fabulous place - love the thought that has gone into equipping it, so many places I've stayed don't have tea pots big enough or large enough tables etc. We had an absolutely fantastic time At the Green Man and I have already had lots of people asking me to send the details - I can't recommend the venue highly enough and I will fill out our feedback - all very positive. We had an absolutely fantastic weekend at The Green Man, it was perfect for us all and we have all said we would love to use it again. The bedrooms worked great for us, we LOVED the bar and the kitchen catered for all our needs. As the Student Sport Team from Loughborough University we usually strive for high standards, and we weren't disappointed with The Green Man! 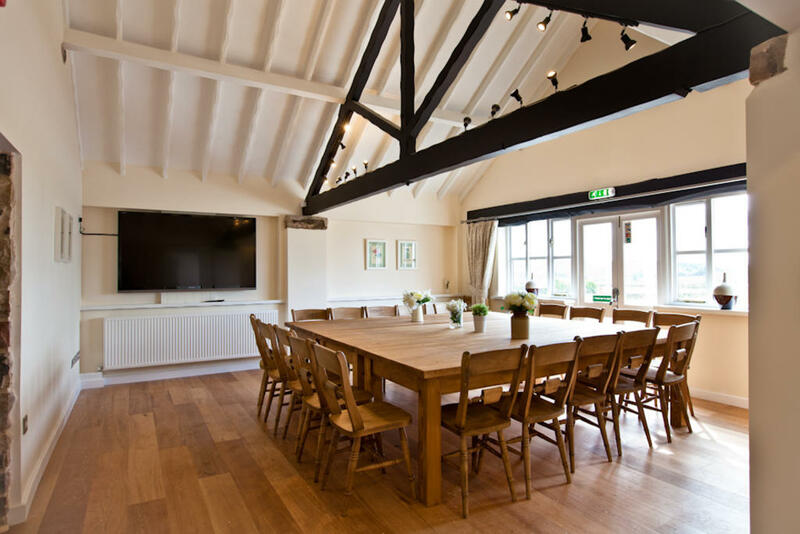 As a large group of 25 we had ample space to both work and relax, as well as enjoy the fantastic facilities at The Green Man. If you're looking for a place to have a work conference or a work away week, this would be a good option. Where do I begin.............we had an absolute blast. The Green Man went beyond all expectations, it was the perfect weekend in every way. A number of people in the group said that they would be looking at the Green Man as a venue for their own family party's. Our age range was 7 to 70 and it catered for all. Please pass on our gratitude to Tracey the place was immaculate when we arrived and we all worked hard to ensure we left it as we found it. I wouldn't hesitate in recommending The Green Man to anyone for any occasion and once we have sorted the deposit, I will be straight on to Trip Advisor to do exactly that!! Thanks again, you made my wife's 40th birthday bash go down in folklore!! I just wanted to say a big “thank you” for the fantastic venue “The Green Man” in Ashbourne. The venue was ideal for our 3 day business meeting . All facilities were of a very high standard. The kitchen was modern, well equipped and the living areas were ideal, especially the bar, pool table and darts! 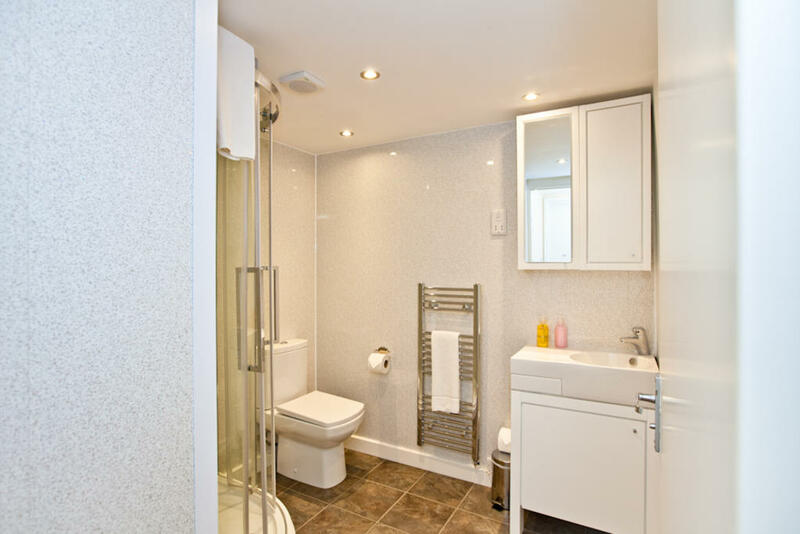 The bedrooms were also of a high standard, especially the bathrooms, which were modern and well equipped. Our business meeting went without a hitch and we would highly recommend this venue. What a fantastic venue the Greenman is! We had a wonderful stay. I cannot express in words how fantastic it was. It definitely exceeded our expectations and we will be back as soon as we can find another excuse for a get together. Every single person commented time and time again how lovely it was; the kitchen, the bar, the lounge and dining areas, the bedrooms, not to mention the views...they were all fabulous! Thanks again team for a great experience. From booking to arriving, every aspect was seamless and we got all the credit from our family! We stayed at the Crew and Harpur last year and that set our expectations for The Green Man high but they were smashed out of the water. The Green Man is amazing. Our group has now used Peak Venues twice and because we've had such great times the event has become an annual thing. We ordered kegs before we arrived and they were ready to pour when we got there. All rooms were spotless, towels and bedding all set up as requested. The Venue was immaculate, plenty of room for all of us to spread out. Also a nice patio outside, which we were lucky enough with the weather to use. Every single one of my group had an amazing time. We're already looking to plan next years event. I can't recommend The Green Man enough, or any of the other peaks venues. There a few local pubs nearby within walking distance and plenty of landscape to take in. The only downside is living with the troughs after you spend a weekend at the Peaks! Just wanted to say a big big thank you for making a special get together with a group of fantastic friends even more amazing. The Greenman excelled all expectations. The website did not do it justice. What an amazing place to stay. The accommodation is perfect, the standard of the facilities is 5 star, I will happily spread the word about Peak Venues and what perfect venues they have. What could be better than having your own bar as the focal point of the place your staying. We had such fun and never stopped laughing all weekend. I'm certain this converted pub made the difference between a fantastic weekend and an amazing one. Another big thank for the lovely Christmas tree to help us have our early Christmas wonderland, it made the atmosphere even more cosy and Christmassy. After staying at Cliff House 2 years ago didn't think you could better it, can't wait to see what venue we stay in next year. Thanks for a great stay. Just returned from a weekend away with a large group of friends. This converted pub makes for a unique accommodation and we were blown away with the quality of the place. From the ice making machine behind our very own bar, to the underfloor heating which kept us cosy all weekend. 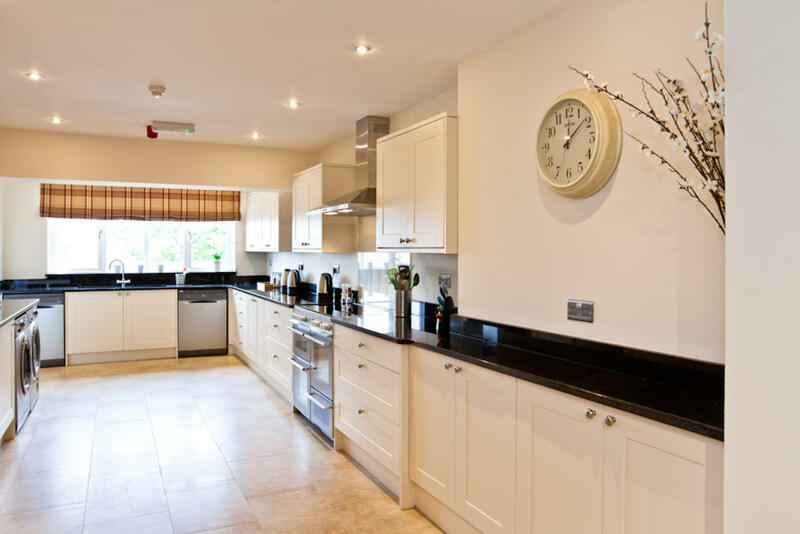 A fabulous kitchen stocked with everything you could possibly need and great bedrooms full of character. Lovely touches from the owners with so many items provided for us like coffee, tea and sugar and lovely hand washes and shower gels in all the rooms. The character of the place has been retained well with the original pub loos complete with hand dryer, all made for a very special stay. Amazing place can't recommend highly enough. 40 members of my family gathered at the Green Man to celebrate my 50th Birthday. Without exception we found the venue PERFECT for our needs. With an age range of 2 - 83 that is saying something! The particular "extra" that wasn't advertised was the on-call availability of the housekeeper through the weekend. She cheerfully and promptly assisted us wether it was someone locking their keys in their room, an extra long extension lead needed or the whereabouts of the nearest hospital when my Dad fell en route to the pub. Her willingness to help has extended past the weekend as Dad is now unable to drive for the foreseeable and she has liaised with Green Flag to arrange collection of his car. Tracy is the hidden bonus of this extraordinary venue - her "can do" attitude, warmth and graciousness was an exceptional and unexpected perk and we will all be coming back for sure. Our stay was great and your venue was lovely. A few of our guests were so impressed I believe they are going to be in contact to check if you have any christmas/new year availability. Royal Oak, Hurdlow - Our very own award winning pub offer open fires, hidden corners, local ales and of course ‘great home-made pub food’. Booking advised. 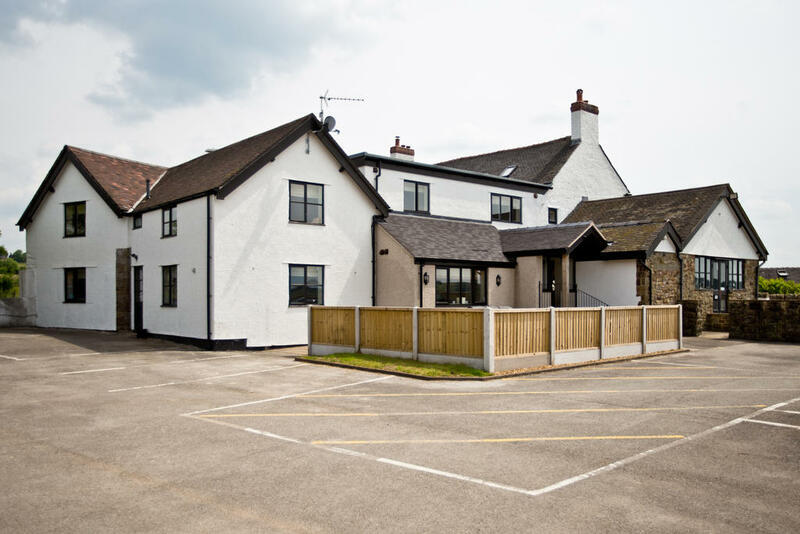 The Three Horseshoes Inn - Does an amazing carvery, great for Sunday lunch. The Duncombe Arms, Ellastone - A country pub restaurant that prides itself on using local and seasonal produce. 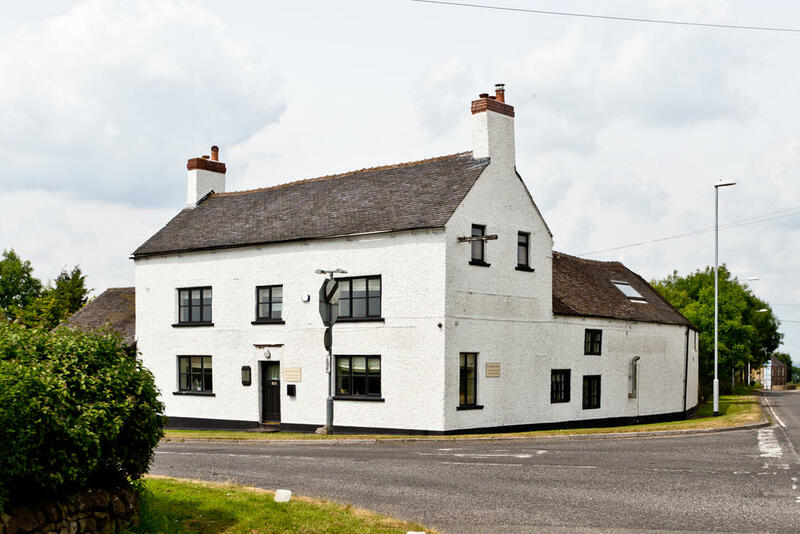 The Lazy Trout, Meerbrook - Traditional country pub serving great pub food. So Thai, Leek - Great Thai restaurant in the centre of Leek that also offers a take-away service. 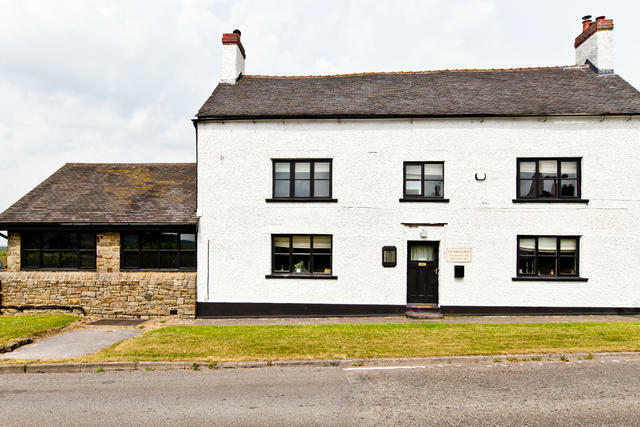 Leek Bar and Grill, Leek - Restaurant, cafe and wine bar specializing in exciting British Fusion food with a seasonal Mediterranean twist. Primo Piano, Leek - Italian restaurant serving authentic Italian food. Mehek - Leek. Indian Restaurant - serving great Traditional Indian Food. The Cottage Kitchen Country Cafe, Winkhill- Just down the road from the property this country cafe and farm shop has a large and varied menu. Dillion's Tea House and Cafe, Ashbourne - Serves a lovely cream tea/afternoon tea. Betty's Sewing Box, Ashbourne - Quirky Victorian tearoom with fabulous home-made cakes. 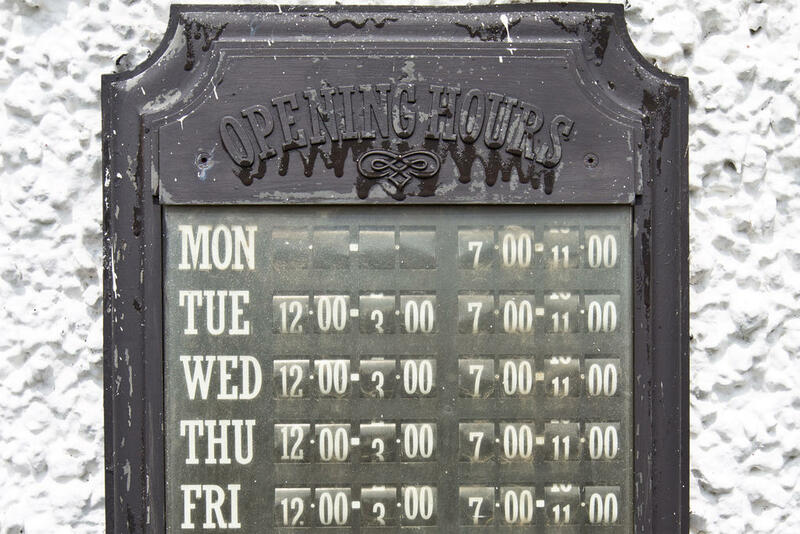 Monty’s Fish and Chip Takeaway - A great fish and chip shop in Leek which will deliver out to the Green Man. Arguably one of Britain’s best theme parks, Alton Towers is only a 7.5 mile drive away. The infamous Alton Towers resort offers a greatfamily day out, as well as the renown rides which provide enough excitement even for the most ardent fun seeker, the Cbeebies land is a great addition to cater for the youngest family members. The waterpark is also not to be missed, with rides for the adrenaline junkies as well as relaxing areas for those who just want to chill out in the Lagoona Bay, and for those looking for a more relaxing day, the Spa is a great place to unwind and chill. The Spa also offers a great selection of treatments if you are feeling indulgent. Click here for further information on Alton Towers resort. 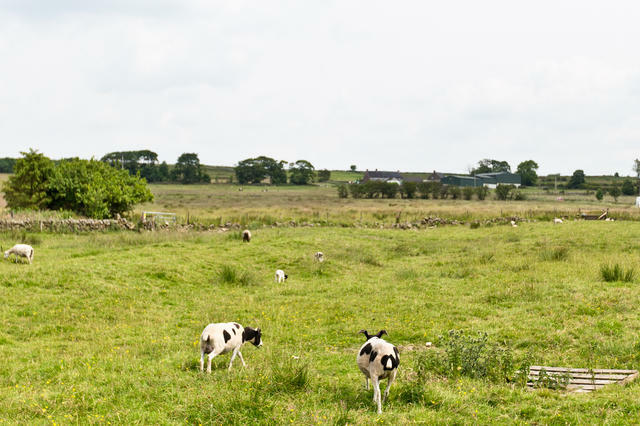 Just down the road from the Green Man at Winkhill, this wildlife park is a great destination for families, with walkthroughs which allow you to come face to face with exotic and endangered animals such as lemurs, penguins and wallabies. 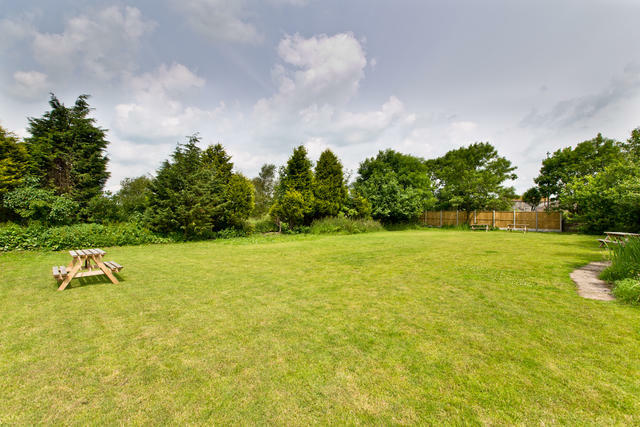 There are opportunities to feed the animals by hand and also a large outdoor play area, sandpit and bouncy castle to keep the little ones occupied. A nice afternoon out for the family, children and adults alike will enjoy a ride on the miniature steam railway, which hugs the outline of Rudyard Lake. As well as the miniature steam railway, Rudyard Lakes offers picturesque walking and you can also hire rowing boats and canoes out. 2 x range cookers with 5 gas rings on each. Both have two ovens each , a grill and the storage compartments at the bottom. 36 guest in various combinations. Please note that some of the beer pumps on the photos are for decoration only and are not in use. Please contact us directly for details on the bar area. 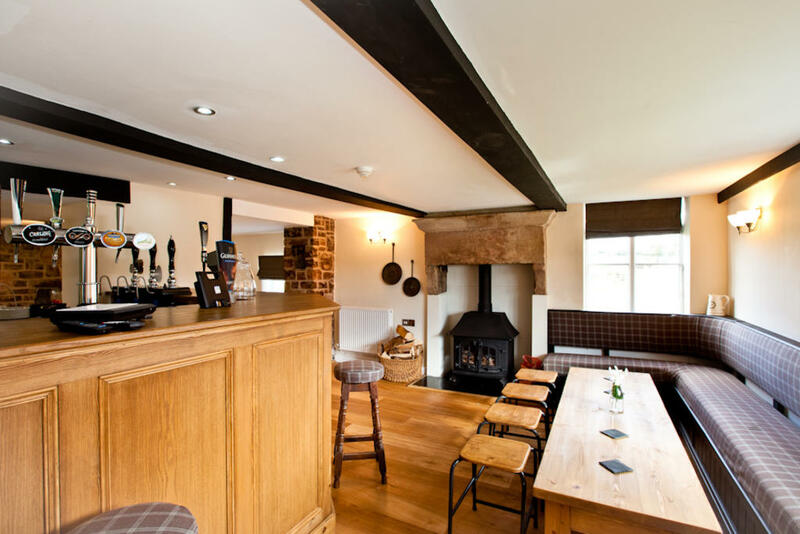 Log burner in bar area – 1 x complimentary basket of logs supplied upon arrival (due to health and safety we cannot supply fire lighters or matches so please bring your own). ½ Oil drum style BBQ – available for use from 01st April through to 31st October, please supply your own charcoal and lighting equipment. Noise Policy - due to quiet rural location, late night noise must be confined to inside the building by 9pm. Neighbours are in close proximity.